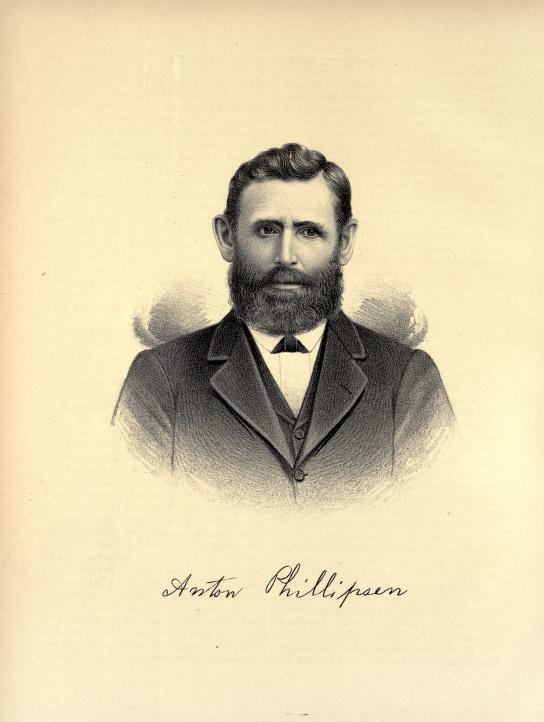 ANTON PHILLIPSEN, a prominent agriculturist and leading citizen of old Ripley, is a native of Prussia, and was born September 6, 1835. Arriving in America when but eighteen years of age, an honest, hardworking, faithful boy, he early appreciated the advantages he enjoyed as a resident of a Republic, whose broad foundation was laid upon the principles of right and justice. When the Civil War threatened to destroy our national existence, no native-born American citizen responded more quickly to the Government's appeal for aid than did our subject, who, entering the ranks as private, gave four years of devoted service to his adopted country, and for gallant conduct upon the field of battle received justly-deserved promotion. Peter and Catherine Phillipsen, parents of our subject, thoroughly trained their son to habits of self-reliance, so that he was well fitted to begin the struggle of life for himself. He was the youngest in a family of four children, three sons and one daughter. He received a good education in Prussia, and upon the well-improved farm of his father became an expert in agricultural duties. Shortly after the death of his father, he determined to join his brother, Peter, who had emigrated to the United States some two years before. In 1853, bidding adieu to his mother and friends, he crossed the Atlantic and, arriving safely on our shores, went directly to Milwaukee, where he remained but a few months. Next locating in Chicago, he spent one year in that city. Afterward for a brief period he resided in Peoria, and then journeyed to St. Louis. Illinois was the final destination of Mr. Phillipsen, and he settled at first in Madison County, but in 1858 he came to Ripley Township, Bond County, and worked upon a farm until August 12, 1861, when he enlisted in Company D, Third Illinois Cavalry. This gallant company of faithful soldiers was for a long time the body-guard of Gen. Steele. Mr. Phillipsen was promoted first to Corporal, then to Orderly-Sergeant, and May 31, 1865, was made Commanding First Lieutenant of Company E, with which his old company was consolidated, December 19, 1863. He served until he was honorably discharged from the service at Ft. Snelling, Minn., October 10, 1865. His company took part in all the sieges, battles, skirmishes and campaigns of the regiment, and accompanied the expedition to Dakota, which closed the term of his service. During the four years and more in which our subject served the Union bravely, he was never sick or absent from duty for a day, except when he had a furlough, at which time, in 1864, he was married to Miss Henrietta, a daughter of Charles Plog, one of the early pioneers of the county. This lady died in 1876, leaving seven children, all of whom are now deceased. Mr. Phillipsen married his present wife, Mrs. Elizabeth (Wormbrough) Wendt, a native of Switzerland, in 1876. They have had a family of six children, of whom but two now survive, Ella and Elizabeth, two bright and promising young maidens, now busily engaged in acquiring an excellent education. Our subject has been a farmer all his life, and has a finely improved farm near town, and a pleasant home in old Ripley village. The family is widely known, and has a large acquaintance and many warm friends in the town and county, which has been the family residence ever since the marriage of our subject. Mr. Phillipsen is well posted in public and local affairs. Although not an active politician, he received the official position of County Commissioner, the duties of which public trust he discharged in an energetic and efficient manner and with satisfaction to the community. Mr. Phillipsen affiliates with the Republican party, and is known as one of its strong supporters. He is interested in educational progress, and upholds and advocates the uplifting of the masses to a higher plane of citizenship. 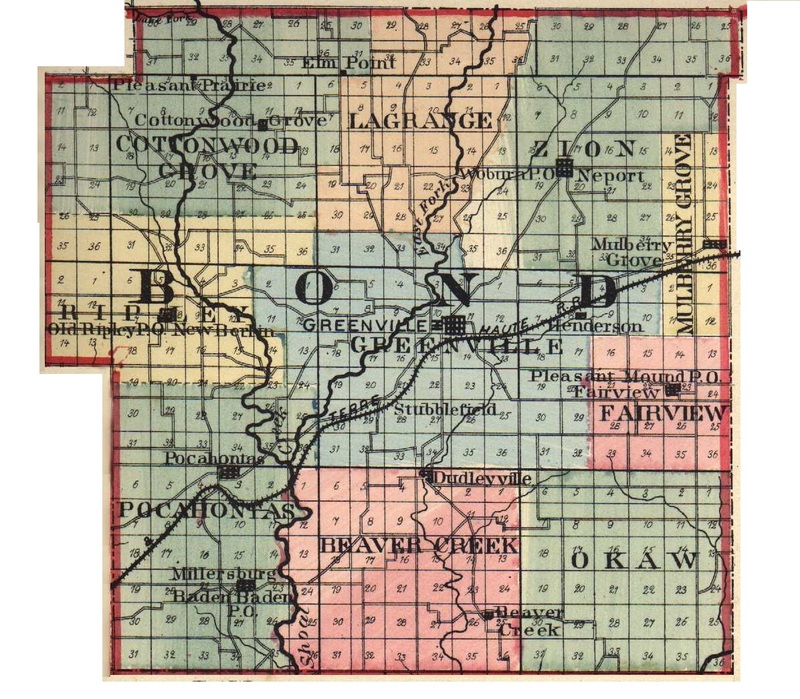 Extracted 20 Dec 2016 by Norma Hass from 1892 Portrait and Biographical Record of Montgomery and Bond Counties, Illinois, pages 422-424.